When I read this verse, I was reminded of when the Marine recruiter came to my high school to sell us on privilege and honor of becoming a marine! He said all that a young man wanted to hear, and his cool uniform made the sell even easier! But in the year 1991 the Golf War broke out, and I decided not be one of “the few and the proud”! 😉 I counted the cost (death) and I didn’t see the Marines in my future. Looking back on my decision, this wasn’t one of my most prouder moments. Lol! My friend, I don’t know who has been lying to you, but serving Jesus comes with a cost! Jesus said in Luke 14:27: Whoever does not bear his cross and come after Me cannot be My disciple. He wasn’t saying to carry a Cross literally, although I think it is pretty cool when you see someone really carrying a Cross! He wants us to carry a Cross of discipline and devotion. When He was speaking to the crowd about true discipleship; He knew He was on His way to His death on a real Cross! He knew His true disciples would not be shaken, but just simple followers would get spooked! 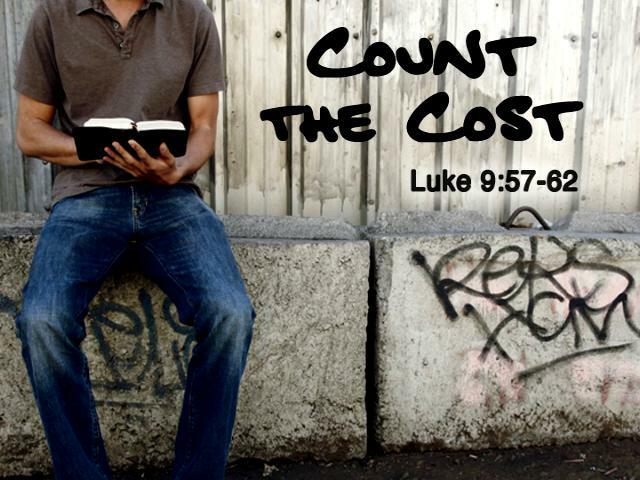 I have counted the cost, and I am ready to be a true disciple!